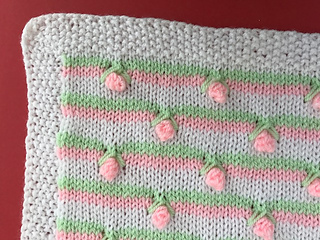 This is a pattern for a pretty knitted baby blanket with a seed stitch border in two sizes. Suggested yarn is Stylecraft Special DK 100% acrylic, 322 yds, (295 m) per 100g ball: 1 (2) balls of white, 1 (1) ball each of pink and green. Any other suitable DK yarn can be used. Actual amounts used (approximately) for S size are white 90g, pink 15g, green 20g, and for M size are white 200g, pink 40g, green 50g. 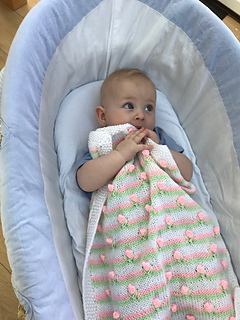 The gauge is not critical, swatch to find a fabric you like with the yarn you are using, and if the gauge is different, you will just have a smaller or bigger blanket. If your swatch has fewer stitches to the inch, the blanket will be bigger; if more stitches, it will be smaller. Adjustments to the quantities needed may then be required. 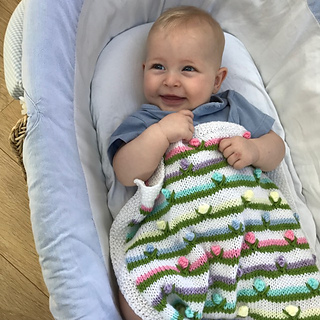 The blanket is knitted flat from the top down, with a seed stitch border at the top and bottom. The side borders are added when the main piece is complete, and the mitred edges joined to give a neat result. 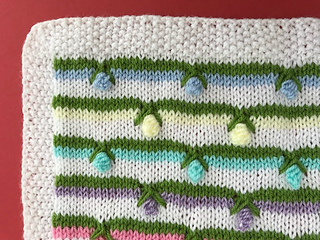 “Seed stitch” is also known as “Moss Stitch”. 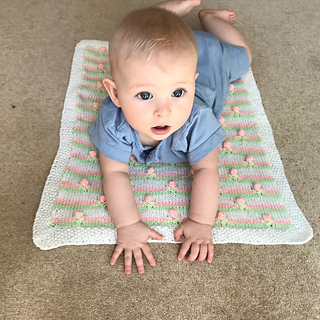 The pattern is written out step by step, with photographs showing how to complete the stitches.